Gracious Hospitality: The Little Things. . .
Little details make a special occasion, like weddings, even more delightful. I'm finding that the weddings attended in which the guest is treated with grace and thoughtfulness are the most memorable. Yes, a wedding is for the bride and groom, but in a sense they are hosting a special event that brings many from far and wide, and at great expense for some. Showing care for the guest creates an atmosphere of mutual love and respect. In this case, the little details become great tokens of thoughtfulness. It's the little things, like having a photographer take a photo of each guest as they arrive for a wedding album or having cold tea and lemonade for the guests while they are waiting for wedding photos to be taken before the reception starts, that makes guests feel valued and as though they are an important part of a special day. Tokens don't need to be expensive or large. Something homemade or handmade can express great care in a simple way. I'm appreciating raspberry-rhubarb jam and apple-cinnamon toast topper in their beautifully decorated jars right now, and will open them and enjoy them later in a completely different way. Yum! Each bite will take me back to Andrew's and Annalisa's special day. 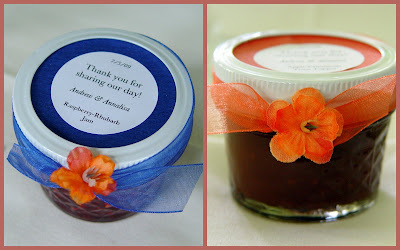 They absolutely made each guest feel special and valued at their wedding celebration. Special, thought touches do make for a great wedding remembrance. Love the ideas from the wedding you just attended. The berries on the cake were beautiful. Just the perfect way to decorate a cake in the northwest. So true...the vast majority of weddings I've attended have done an excellent job of being all about the bride and groom, but have shown very little regard for the guests. It takes special effort, I'm sure, but how nice to leave your guests thinking warm thoughts. Sounds as if this bride and groom and their families did it just right. I am loving everyone's comments! Thank you! It's always good to hear from blogging friends. . .
What a nice, and unusual gift to guests!